Automatic Updates - Notifications when updates are made to projects helps all parties stay on task and understand where each project stands in terms of completion. Flexibility and Customization - We have been successful in customizing the different fields in vTiger to match our specific needs, whether in the sales section, tickets section, and projects section. Reporting - The ability to create customized reports is great and very useful to management to understand areas that may need attention. Support - If you have a question, the vTiger support team is outstanding in terms of responses and ensuring that your issues is resolved. In addition, they are frequently releasing updates and upgrades to the product. Confusing - Finding where to put information can be confusing at times and can lead to frustration. Reporting - While the ability to create a ton of reports is nice, navigating the reporting tool is a bit overwhelming, especially in the beginning. CRM Notifications - I am a bit old school in that I want to be able to schedule a time to follow up with someone in our CRM system at a specific data and time and receive a pop-up notification when that time comes. With vTiger, I have not found a way to do this and when I ask to be notified, I get notified instantly, not at the time I want to follow up. It is as good as you could expect for a company that operates from another continent. Emails are quickly responded to and do not usually require additional questions or answers. It is quite rare for a company of their size to be as responsive as they are and that makes them a sound choice to deal with. 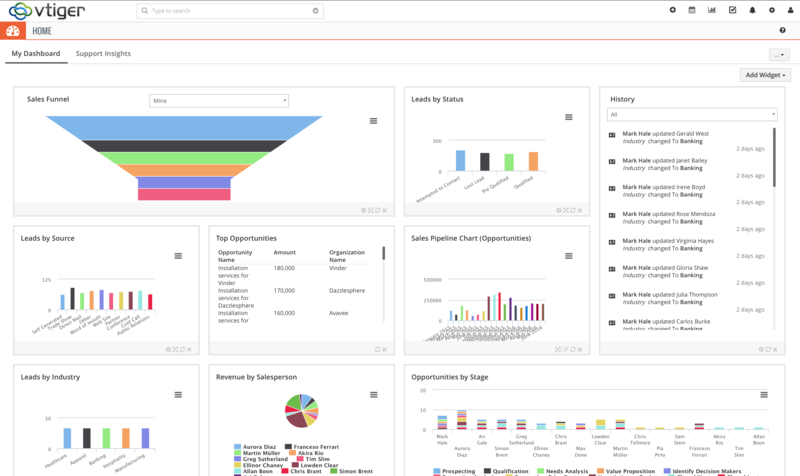 Integration Across the Organization - What started out as just a CRM tool for sales is now being used for ticket management and project management. Steep Learning Curve - It is not as intuitive out of the box and really requires a dedicated person to be a vTiger expert which can be challenging and time consuming. Reliability - Sometimes features that worked yesterday don't work today, thus causing more time to complete the same exact task that was done previously. The thing that comes to mind specifically is the main search box as 1/2 the time it works, 1/2 the time it doesn't work. Discounts are provided for both annual subscriptions, and for high volume users.